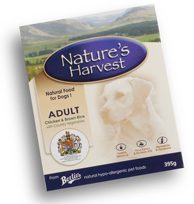 Natures Harvest Adult Complete Dog Food with Chicken and Rice is a natural complete dog food, made from the freshest meat, whole brown rice, carrots and peas. The sole meat ingredient in Natures Harvest Adult Complete Dog Food with Chicken and Rice is fresh chicken; ideal for dogs with a dietary sensitivity to other meats or fish! By avoiding ingredients which commonly trigger foods intolerances and food allergies, Natures Harvests gentle recipe will help calm even the most sensitive stomach or skin!